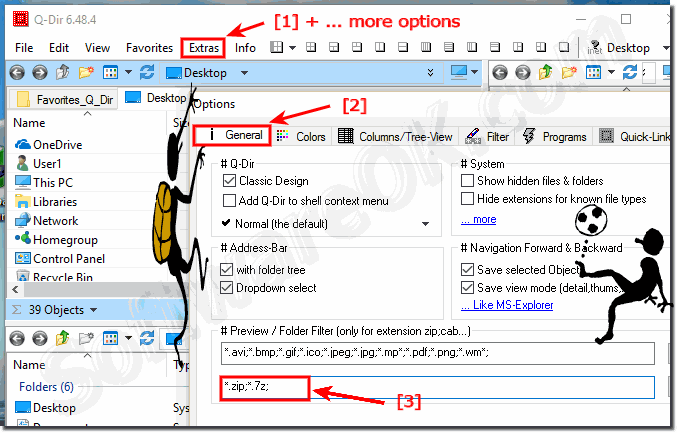 Here the Solution how to to block the Filemanager to open *.zip, *.rar *.cab folder and others in explorer view! I will open/add a second solution in future. Please always use the latest version of ... the Quad-Directory-Explorer! This can be done wonderful! Q-DIR - FAQ-20: How can I block to open *.zip, *.rar *.cab folder in explorer view? Thanks for this great minimalistic explorer alternative. I love that it's so lightweight and doesn't have all those unnecessary features. Three small things I would love to have though are options not to use zip foldes (I use WinRAR for all), and options for setting standard folder view that never changes, and setting standard start dir that never changes (unless I want to of course). Keep up the good work! I am unable to stop Q-Dir (version 3.51) from opening .zip file within Q-Dir. I have both WinRar and WinZip installed on my computer. While using Q-Dir, when I click on any .rar file, WinRar opens itself inside WinRar; However, when I click on .zip file, the zip folder opens itself inside Q-Dir instead of WinZip. I was wondering if there's a way for me to use Q-Dir when I click on a .zip file, WinZip would opens itself in a the WinZip window rather than inside the Q-Dir window? I had followed what was suggested on your FAQs (http://www.softwareok.com/?seite=faq-Q-DIR&faq=20), and the problem remained the same. Can you import associations from the normal explorer in XP? e.g double clicking a .zip file will open winzip.